Happy May! I asked you guys what kind of content you wanted to see more of on here and I had a lot of request for hair posts. So, I'm kicking off the new month with these amazing hair products from RG Cosmetics I recently tried. If you are not familiar with RG Cosmetics, they are a hair care line with high-quality products to target core hair issues and keep hair healthy for all types of hair. I'm very picky when it comes to using hair products ever since I went natural about 4 years ago and left all the perms, gels and hair dyes with harsh chemicals behind. I promised myself to restore my hair and only use products that would benefit my hair. Trust me guys, it's been a long road for me in the hair department! If I ever recommend or share any hair products with you guys it's because it has beneficial ingredients. 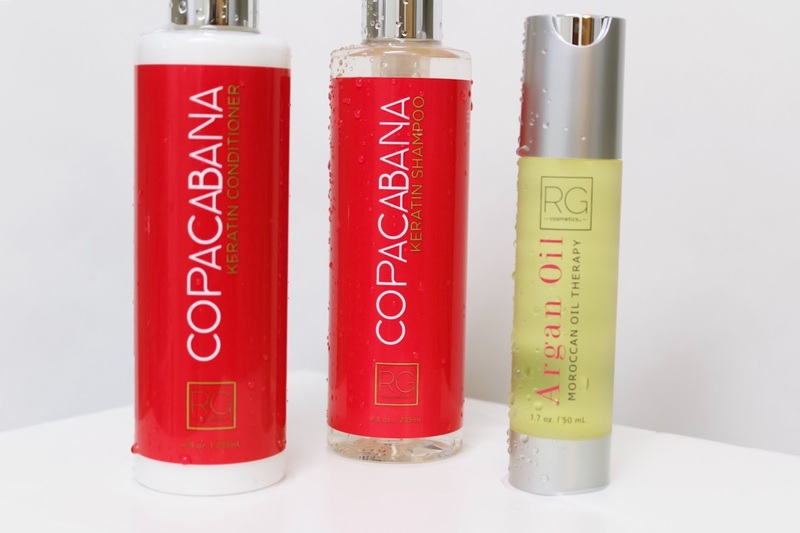 I recently tried the RG Cosmetics COPACABANA Keratin line and it smells like heaven in a bottle. I wish there was a "scratch n sniff" button in this blog post because these products truly smell amazing. It left my hair looking silky and gave my hair body and movement. The packaging on the product is cute and convenient, both the shampoo and conditioner come in an 8oz pump bottle. I also got to try their Argan Oil which was the perfect finishing touch after my blowout. The shampoo has keratin vitamins and amino-acids with unwanted salts and sulfates. The keratin is infused with nutrients to prevent split-ends and repair damage hair. It leaves a nice amount of moisture in your hair without it feeling overwhelmingly greasy. The conditioner has vitamins and aloe vera that hydrates and restores dull dry hair. It leaves hair soft, manageable and silky. My hair gets really really curly when wet and it was super manageable to detangle my hair with this conditioner. The argan oil was the cherry on top! I used a few drops after I blew out my hair and it gave my hair a nice silky shine. The product treats dryness and repairs split ends and protects against heat damage. It's super light and didn't weigh down my hair. I truly fell in love with these products from RG Cosmetics. It's always good to change up the products in your hair routine so your hair doesn't get bored and stops responding. It was definitely time for me to switch up my hair products and these RG products were perfect for my hair needs. My favorite was the Argan oil because it smells amazing and I love oils that give me shine without weighing my hair down. If any of you guys have tried this brand let me know your thoughts in the comments below. Hope you guys enjoyed this hair post! I will be updating you guys on Twitter how my hair continues to respond to these RG Cosmetic products in between washes. Todos los ingredientes son pura vitamina para el cabello, me encantó la presentación y lo mejor los resultados te quedó el cabello super brillante. Gracias Patty por la recomendación. Gracias Alicia! Y el olor es como flores!! I really love your Instagram Video! You are so cute babe. And course I will try this product, your hair looks beautiful and the most important thing is healthy. Thanks for share the review babe. Thank you babe! I'm obsessed with these products!! Patty!!! Esto se ve es espectacular. Me encanta los ingredientes que tiene!! Es un producto que definitivamente voy a probar.